Decluttering. Downsizing. Rightsizing. Organizing. Spring Cleaning. Tidying Up. Whatever label you prefer to describe the state of affairs in your house, you have grown tired of talking about it, looking at it (and avoiding the overflowing closets and cabinets) and are now ready to tackle the job. Good, but what’s your plan of attack? Here are 4 organizing tips to help you put a plan in place. Most of us approach decluttering by starting in a room, which seems logical. Go through the bedroom closet and drawers today, turn to the hall closet and shelves tomorrow. Logical maybe, but fatal, says Japanese cleaning consultant Marie Kondo. “In the majority of households, items that fall into the same category are stored in two or more places scattered around the house. Say, for example, you start with the bedroom closet. After you have finished sorting and discarding everything in it, you are bound to come across clothes you kept in a different closet or a coat draped over a living room chair. You will then have to repeat the whole process of choosing and storing, wasting time and effort, and you cannot make an accurate assessment of what you want to keep and discard under such conditions” she writes in The Life-Changing Magic of Tidying Up. Better to start by category. 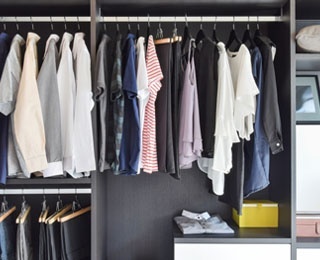 Gather all your clothes in one spot, though if you are like most people you will probably have to divide the big pile into sub-groups – coats and jackets, tops, sweaters, etc. Then you are able to see the big picture and can begin sorting – keep one blue jacket, not three, pick the whitest T-shirt, etc. Do the same with books, artwork, toys, exercise equipment – and don’t forget to check the garage, basement and attic. Clothes – ours, our spouse’s, our children – takes up a lot of space in most houses. Because of sales and ease of shopping, we often treat ourselves to a new item. We have clothes that are worn, but so comfortable; items we wear once or twice a year, maybe not even; clothes for when we lose or gain 10 pounds, and on and on. So sorting through clothes can be a challenge. Ask yourself three questions, says Marni Jameson, author of Downsizing the Family Home: What to Keep, What to Let Go. “If not, then out it goes,” she says. If you suspect you will struggle to answer these questions honestly, enlist the support of a friend or family member who will be candid. Or try on the clothes, stand in front of a full-length mirror, and say aloud the first word that comes to your mind. And once you get your clothes under control, Marie Kondo has two suggestions to keep them that way: fold clothes kept in a drawer into a simple, smooth rectangle, as shown in this video; and arrange clothes hanging in a closet rising to the right, meaning clothes shorter, lighter and thinner. Also, keep a “donation” bag going all the time in the back of your closet, so you can easily drop something in that doesn’t look right or has just been replaced. We love our books, but, yes, you can have too many of them. Paperbacks dusty and falling apart, out-of-date textbooks, books that were gifts or bought from the bargain table still unread a decade later. Books and bookshelves can take up a lot of living and storage space, and are heavy to move. The good news is that you can easily find a new home for them. You can donate them to your local library for its annual sale, drop off a few at a nearby Little Free Library or sell them at a used bookstore like Half Price Books. Train stations, retirement communities, health clinics and other communal places might also be a drop-off site, but ask first. And you can always regift, or even tell your poetry-loving or fiction friend who also has too many books to read and pass on. Take the 12-12-12 Challenge. Throw away 12 items, donate 12 items and return 12 items to their proper home. Or play the Four-Box Game. Place every item in every room into one of four boxes – trash, give away, keep, or relocate. These suggestions, and more, come from Joshua Becker, author of Simplify: 7 Guiding Principles to Help Anyone Declutter Their Home and Life. Quoting Dale Carnegie, “People rarely succeed unless they have fun in what they are doing,” Joshua advocates people approach decluttering with fun, excitement and creativity.